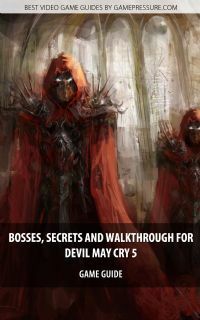 Devil May Cry 5 Guide Strategy Game Guide and Walkthrough for Download. Get your special mobile or desktop version of our game guide. The Devil May Cry 5 Guide is a comprehensive source that will let you complete 100% of the game. With our walkthrough, you can complete all 20 missions, unlock higher difficulty levels, defeat powerful bosses, or discover all hidden missions in the game.